Metal Wardrobes in SS with Soundless Steel. Supported by a team of determined and dexterous professionals, we are able to manufacture and supply attractive range of Metal Wardrobes. 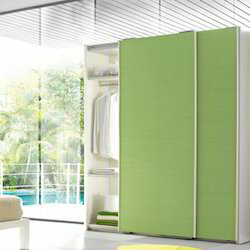 These wardrobes are intricately designed as per the industry standards and norms. Our range of these wardrobes is available with the many of the shelves that allow the users to keep their dresses accordingly. 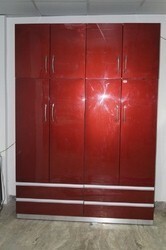 These wardrobes are available at most affordable rates. We are one of the well known and reputed manufacturers and suppliers a wide range of Designer Wardrobes. These wardrobes are available in many of the models and other related specifications as per the industry standards and norms. Our designers have designed these wardrobes in attractive and elegant designs. 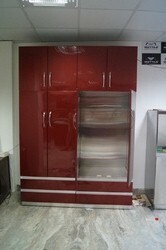 Our clients can avail these wardrobes are available at most feasible rates in market. Under expert guidance of our engineers and technicians we manufacture, supply , export and wholesale a wide range of high quality stainless steel Modular Wardrobes having multiples shelves in different colors and sizes, These have long service life and stain resistant. These can be used for multipurpose storage. These are spacious and easy to install and have fibula's appearance. 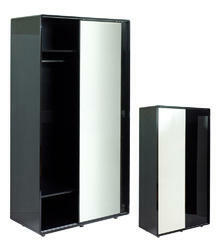 We offer exclusive Black and WhiteSS Wardrobes to our valuable clients. It is available in various sizes, shapes, colors and vibrant design patterns. 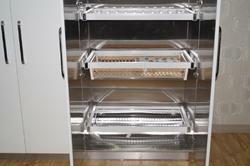 It is manufactured using excellent craftsmen and latest machinery. It comprises of multiple drawers to keep kitchen cutlery which cooking pan namely frying pans, boiling pan and many others. It is corrosion resistant and is easy to handle. Our product range encompasses elegant modular kitchens, Stainless Steel Wardrobes, stainless steel modular kitchen and island kitchens. These products are highly appreciated for features like reliable performance,rigid construction,corrosion resistant finish, sophisticated designs, elegant looks,longer service life,optimum quality & excellent performance,these are widely used in kitchens,hotels,restaurants,& industrial canteens. We export our products all over the world. Leveraging on well equipped infrastructure facilities and strong workforce, we are able to manufacture and supply a large range of S S Wardrobes. 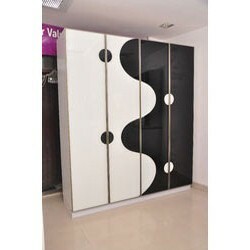 We have artistically designed these wardrobes as per the latest styles and trends of the market. The materials we have used in fabrication of these wardrobes have been procured from some of the authentic and genuine sources of the industry; possess rich industry experience. Keeping in mind the varying demands and specific requirements of the clients, we are engaged in manufacturing and supplying Stainless Steel Wardrobes. These wardrobes are designed and developed as per the clients’ given specifications and in accordance with the industry standard and norms. Available in many of the models, these wardrobes are offered in attractive patterns and at most economic rates in market. We supply Designer Stainless Steel Wardrobes which are huge in size and are available in different color and design pattern. It has a shining surface and smooth finishing. It is corrosion resistant and is widely used in residential houses. It has a long service life. Looking for Stainless Steel Wardrobes ?